The U.S. Senate is one of the most idiosyncratic and quirky pieces of our political system. Every state, from the massive quasi-nation-state of California to sparsely populated Wyoming, has two U.S. senators elected to six-year terms in two-year cycles in which a third of the chamber faces voters. The system is deliberately anti-democratic (and at present, anti-Democratic), and also creates a lot of instability in many states’ representation for the simple reason that different cycles have different partisan dynamics. Roll Call points out today that five states currently have sets of U.S. Senators who almost entirely cancel each other’s votes. 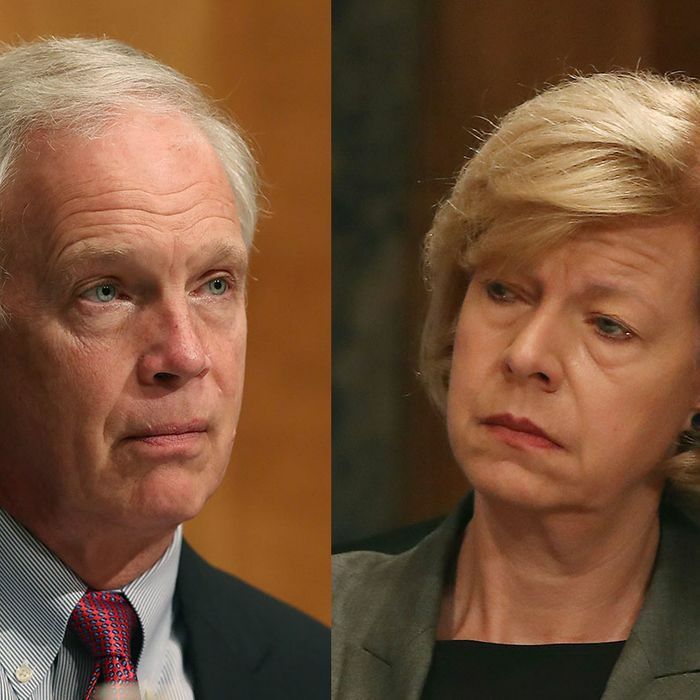 The most extreme “odd couple” is from Wisconsin: Democrat Tammy Baldwin and Republican Ron Johnson, who have voted the same way just twice in 134 Senate votes this year. Patrick Toomey (R) and Bob Casey (D) of Pennsylvania; Sherrod Brown (D) and Rob Portman (R) of Ohio; Cory Gardner (R) and Michael Bennet (D) of Colorado; and Bill Nelson (D) and Marco Rubio (R) of Florida vote opposite ways most of the time as well. There are actually seven other states with split representation in the Senate: Indiana, Maine, Missouri, Montana, Nevada, North Dakota, and West Virginia. Looking at all 12, there are some clear patterns of explanation. Colorado, Florida, Nevada, and Ohio are closely contested battleground states where slight tilts attributable to particular elections or to special senatorial characteristics (e.g., Marco Rubio’s appeal to Hispanic voters) can easily produce different results. Pennsylvania is a Democratic-leaning state whose Republican senator, Pat Toomey, has been fortunate to run in two election years (2010 and 2016) where the GOP did particularly well. Indiana, Missouri, Montana, and North Dakota are Republican-leaning states where Democratic senators have run in unusually good cycles (2006 and 2012), and in two cases (Indiana and Missouri), have benefited from fractious GOP primaries that produced weak nominees. Maine is a state that uniquely values independence, and so has elected the most moderate Republican senator of them all (Susan Collins) and a formally independent senator caucusing with Democrats (Angus King). And strange as all these “odd couples” may seem, there is no question that partisan polarization is steadily shrinking their ranks. Twenty years ago, in 1997, there were 19 states with split Senate delegations. Ten years from now, there could be far fewer than 12. What may be fading even more rapidly than accidentally split Senate delegations is the phenomenon of a state’s voters deliberately choosing to have one Democratic and one Republican senators. For decades Iowans regularly reelected Democrat Tom Harkin (first elected in 1984) and Republican Chuck Grassley (first elected in 1980) to the Senate by large margins. As they ascended in seniority, Iowans very consciously began to value having an influential senator from each party defending their interests. But then Harkin retired in 2014, and Iowans elected highly partisan Republican Joni Ernst to succeed him, by a large margin, portending that battleground state’s dramatic slide in the GOP’s direction in 2016. Partisanship is beginning to conquer all in American politics, and for all its hoary traditions and pretensions to lofty and deliberative statesmanship, the U.S. Senate is no exception.